If, as I do, you subscribe to the view that if a place is good then it'll be busy, then No. 33 is among the very best of the tea shops on this website. If you should visit on a Saturday morning, be prepared to wait for a table... but rest assured, it is worth the wait. Since you've come to this website, you'll be interested in the quality of the tea - it's good, really good - even the pots for one have little infusers that sit beneath the pot lid, allowing loose leaf tea to be used without the need for strainers. And the tea is perfectly enclosed too - there's never any of that nonsense of stray tea leaves soiling the dregs of your cuppa. Good job too. Not only that, a pot for one will do you nearly three cups! And if English Breakfast isn't, well, your cup of tea (I had to use that pun on here eventually), you'll be pleased to know that decaff, Earl Grey and fruit teas are all available, as is the obligatory range of coffees (perish the thought). The service is exemplary too, by the way - it's hard to imagine how the staff could be friendlier. Even when they have to tell you there's a wait for a table, you don't mind because they're so apologetic, and you know it'll be worth the wait. So what else makes it so good? Well, it's great for a breakfast bite: personally, I'd recommend the bacon sandwich (the menu proclaims "the best bacon in Norwich" and you know what, I think it's right), though the eggs benedict always looks pretty darned good too. And then there are the cakes... the pick of which is, undoubtedly, the Victoria sponge, topped with little chunks of strawberry. They put something, as yet unidentified, in the icing on top that makes it... well, almost indescribable. You'll have to try it for yourself but trust me, you won't be disappointed. They'll box a slice if you want to take some away too. As if all that wasn't enough, there are newspapers (national and local) and magazines to sit and read as you chill with your cuppa, and there are artworks on the walls from a local artist, some of which are for sale if they take your fancy. No. 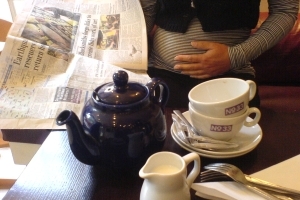 33 is truly great, the dictionary definition of what great tea in a great tea shop should be all about. If you go there on a Saturday morning, there's a fair chance you might see me in there too and really, what better recommendation than that can I give?